How can everything be said that you would enjoy knowing, but let us reminisce in some of the history of Peace Baptist Church. During a time of disturbances and confusion in other area churches, a few believers came together to organize a new church. The name chosen out of this calling of peacemakers was "Peace Baptist Church", on the third Sunday of September in 1921. It was located in the home of deacon Reese on Clark Street. The first pastor was Reverend J.S. Jackson. In 1922, Rev. Abe Williams served as pastor. He was followed by Rev. Jameson and the church was located at 1342 Central Avenue. In 1923 - 1928, Rev. J.M. Stevenson served as pastor. The church was located n the southwest corner of David St. and John St. In 1929, Rev. C.H. Reese served as pastor until his death in December,the same year. Rev. R.A. Malone took over until October of 1931, to be followed by Rev. Isaac Gibson until 1932. Rev. B.F. Sorrel served as pastor until 1933, then Rev. Joseph Hudson became our pastor for the next 30 years, until 1963. Under the pastorate of Rev. Hudson, many people came to the Lord. He organized many ministries including; the first Gospel Chorus, Busy Bee Club, Willing Workers Club, Missionary Society, Junior Mission Guild and Junior Choir. The church relocated to 1552 Baymiller St. due to an urban renewal program in the city. A flood forced the church to move again and a new building was built at 840 Oliver St. 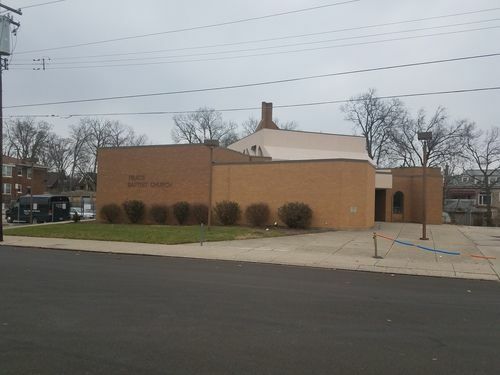 In 1958, PBC purchased the old Jewish Synagogue at 658 Rockdale Ave. In 1963, Rev. Hudson retired. In 1963, D.L. Motley was called to serve as pastor for 25 years, until 1988. Pastor Motley came knowing that "without a vision the people perish". As membership grew the church prospered and a parsonage was purchased. In December of 1967, the church had a mortgage burning service for the property at 658 Rockdale Ave. and the pastor parsonage. In 1977 and 1979, Pastor Motley inspired the church t purchase grounds for a new church home. One the second Sunday in March of 1982, PBC members marched into their new facility, giving God praise. In 1988, Pastor Motley retired; served upon him was the title of Pastor Emeritus. In 1988, Rev. Williams Green was called as interim pastor. In 1990, Rev. Gregory Chandler, Sr. served as pastor until 2003. On October 2, 2001, after fifty years of kingdom services, with twenty five years being at PBC, our Lord took Pastor Emeritus D.L. Motley to his eternal home of rest. On the third Sunday of September in 2003, Pastor Chandler announced that he was leaving to pursue his vision. However, the Word of God was being sent forth through the preaching and teaching of Rev. Stephen Talbert and Rev. Michael Mixon. On April of 2005, Rev Stephen Talbert became Interim Pastor of PBC. Also, in 2005, God granted PBC to purchase the building to the east of the church and the triangle area near Reading Rd. On August 11, 2006, PBC voted to accept Rev. Kenneth Manuel as our present pastor. Pastor Manuel's initial sermon was "Let's Celebrate" and PBC has been celebrating ever since his arrival. He has been preaching and teaching a contagious Word weekly. Pastor Manuel states on a regular basis that, "Peace Baptist Church is a great place to go to heaven from, and he loves being our Pastor."